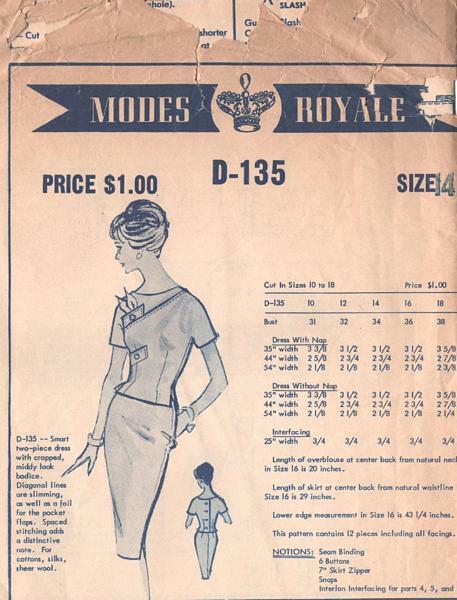 Vintage Modes Royale sewing pattern number D-135. Two piece dress features fitted back button top and slim skirt. Top has bateau neckline and diagonal interests. Pattern is used and complete. Pattern pieces are in fine condition. The instruction sheet is complete but does have a good amount of wear and tears to upper the edge. Unprinted pattern pieces, factory precut and perforated for identification. Not dated. Circa early 1960'.